Everyday we seem to get more confirmation that our move to the farm is the best idea ever. I can't wait to not get nasty notes left on my car from neighbors. I can't wait to see the stars at night again, can't wait to go to Country Cousins on Saturday for Coffee. Can't wait to stop my car mainstreet Linden to chat with someone across the road. So now our nights are filled with finding house plans (might have found one we love!) and me searching for the perfect kitchen. 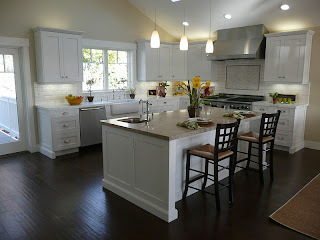 Very cool kitchen! 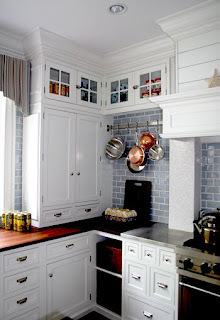 I like the little glass cupboards at the top! That will be my kitchen someday too.